What’s New in DataGravity Discovery Series V2? I was rereading my article from yesterday on the Log Insight Content Pack and of course I realized that the requirement of DataGravity array firmware v2 had nothing public on exactly what it was. I had done a vExpert webinar on that subject which I have shared out the video and slides here. But do you want to know what the newest features of data-aware storage are? One of the tag lines of this release is “Security at the Point of Storage” and it is pretty good. While the array doesn’t do security exactly, but rather enforces your security, which is generally Active Directory ACL type security, it does in fact allow you to understand what you have and who is doing what. So a big help. But here is what is new. I am going to try and provide pictures wherever I can to make sure things are clear and make sense. So in no specific order here is the new stuff! False-positive tag management – if you discover that one of your documents is tagged as having a credit card inside it and it does not, you can remove the offending flags from that document. The tags will ONLY come back if the document is edited again (and whatever made it positive stays). In the screenshot below you can decide which of the tags to remove and be aware it may take a while in the background to accomplish. Additional pre-defined tags – US Address, Birth Date, Postal Code, and Phone Number are all newly added pre-defined tags that you can use right away. 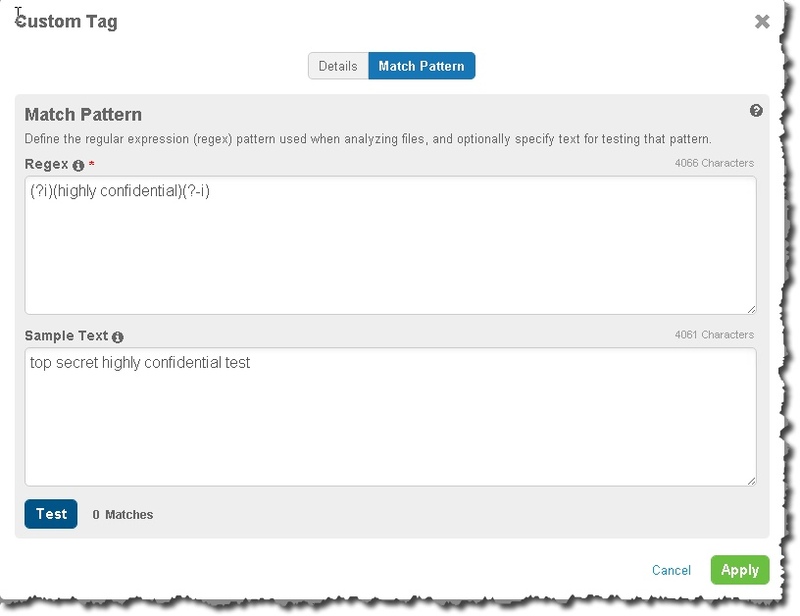 Custom designed tags – you can use regular expressions to define your own tag(s). Once defined the DataGravity array will find where they exist as if they were pre-defined tags. Complex RegEx example but very instructive! BTW, I include the complex example because the engineer (thanks Eric) worked really hard on it. It is not only RegEx that picks birthdays but it has some great examples in the code to make sure it is really is a birthday. So good examples of parameter checking. Exception Identification – you can see in a file’s File Details any reasons that the DataGravity engine did not index the file. Things like encryption can be a potential reason to not index. Selective Search, Discovery, and Activity Tracking – this is a most welcome addition. You can selectively turn off the advanced analytics on mount points – so this means VMs, iSCSI LUNs or NFS mount points. So for all of those VMware Appliances running in your virtualization world you can select the lowest level of analytics which is Activities Only and that will help your DataGravity appliance scalability since there will be no cracking and indexing included in that level of analytics which saves on resource utilization. This would be handy on things like DNS / DHCP or Domain controllers since people don’t work on them and so you don’t likely need all the files on them in your indexes. See below the screenshot on Intelligence Profiles to see where you can select Activities Only which means advanced analytics is turned off. Intelligence Profiles – you can select exactly what tags you want applied to a mount point by adding them to a profile and apply that profile to the mount point. 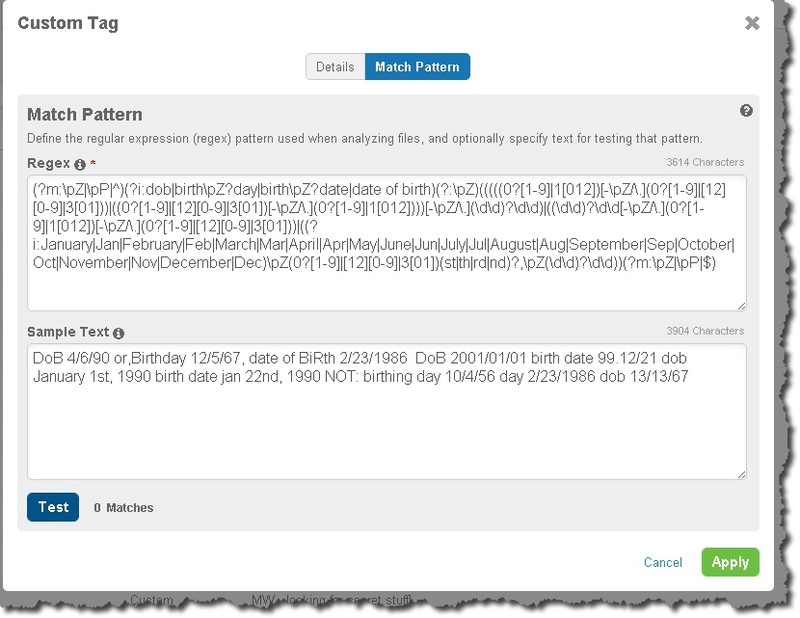 You can choose from any tags – custom or pre-defined to create your Intelligence Profile. Subscriptions – you can subscribe to a saved public search and you can be proactively notified via email when it finds results for that search. Content Alerts – you can use a saved public search and when results are found in that search have a syslog delivered report sent. Note how in the payload you have a URL? That will take you right to the search results that generated the content alert. Log Forwarding – you can enable a syslog destination and have Audit Logs and System Events sent off host. Audit User Role – you can use this role to provide an end user with additional capabilities to do an audit. This is however, not a read only role. It will allow the user to search, look at activity tracking, file analytics, and the Audit Logs. DataGravity Management Pack for vRealize Operations – this will not only provide additional DataGravity metrics to vROps but it will also support tag based PII alerts in Risk / Compliance in vROps. In technical preview there is even an additional adapter that supports Actions. You can find more about this MP here. DataGravity Content Pack for vRealize Log Insight – you can find out much more about this Content Pack in this article. Upgrades – In version 1 upgrades required an outage, but now in version 2 upgrades are much better and do not require an outage. I must admit I really appreciated this as I could upgrade in beta much faster and with very little impact! Performance – Version 2 performs much better then version 1 but I do not like sharing specific numbers – so I won’t – but I can say it is noticeable. User Interface – there are various improvements here – including in areas like performance monitoring, alarm management, context sensitive help, and better user operation feedback. So that is the big list. There is a bunch of little things in the UI, and quite a number of things under the covers that I am not sharing here as they are much harder to describe! Suffice it to say, version 2 is big. Questions or comments are welcome!